Graduation season is upon us! While some colleges end in May and others in June, the fact is that everyone around us is talking about graduation. Students are preparing writing their final essays, professors are organizing exams, and families are getting ready to travel to their loved ones' school for the big ceremony. I fall into the category of the last one. People do not realize that graduations are more of a hassle for the families of the graduates than the gradutes themselves! I spent last weekend helping my sister move out of her dorm, taking her shopping for her dress, doing her hair and makeup, all this just to take graduation pictures with her friends. And guess who took them? That's right: yours truly! I was using my trusty Canon T3i, but I was such a mess. I had to juggle the camera, the lenses, the makeup (yes, for touch ups), bottles of water, the tripod and more! If only I knew about this product last week, it could have made my weekend a lot easier! 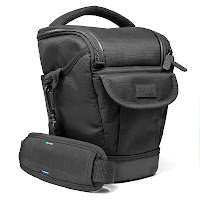 The USA GEAR Weather Resistance Digital SLR Camera Case seems to be the hero I was looking for! With 6 accessory pockets, adjustable shoulder strap and a weather proof exterior, it is ideal for photographers who are doing a lot of shooting at once. The water proof hard shell bottom ensures that your camera and accessories are safe no matter where you go! I like that there is one velcro pocket in the front, so I can easily grab a battery or lens cloth without having to open the whole bag. And you know what else? You can save 50% with the coupon code found in the newsletter. Even though I know graduation day on Friday is going to be hectic, at least I know I can have some help. Thanks, USA GEAR!